> rMP3 (MP3 Shield) Giveaway! 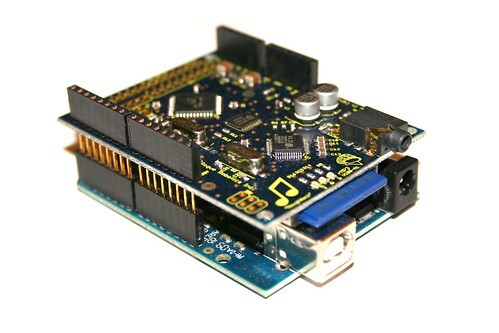 In honor of the new Arduino forum, we're giving away a free rMP3 Playback Shield! For those of you who don't know, the rMP3 is a shield for the Arduino which can play MP3's, as well as read and write data on SD cards. Follow @rogue_robotics on Twitter and retweet our contest tweet to enter. Easy as that. We're thinking about running some other project contests as well for those who create something cool with the rMP3. Let me know what you think. Yell at me if you have any questions. Re: rMP3 (MP3 Shield) Giveaway! Just a reminder: Giveaway ends tomorrow! Shame I don't use twitter.. I'll just have to look into buying one I guess. Congratulations to rmm200! They won the free rMP3! Yes you can. Options include creating a parallel interface (directly or via shift register), I2C, SPI, all depends on the DAC, how many bits it requires, how fast you want to update it. Probably start a new thread tho, vs this promotional give away thread. Awwww, I was really hoping I would win. Well, just stay tuned to our Twitter account. We will be having some more giveaways shortly. Cool, quick question, When do you think you can update the UMMC? What needs updating, I'm using one atm, can't find many things to change on it (I've been trying to think of things). @fluffalafagaus: what are you looking to do with the uMMC? What do you mean by update?